It’s been years since the pitter-patter of little feet have been heard at the SOS Children’s Village in Malakal town. There are no giggling children swinging on the playground. What used to be a place of joy now lies desolate. Rusted metal frames and broken glass are all that’s left in the bedrooms. A ghost town is the only apt description for a place that provided solace to hundreds of orphans before civil war broke out in South Sudan. Today however, UN volunteers based at the mission’s field office for the Upper Nile region have taken a day off to share in the spirit of volunteerism by cleaning up the place. They are thankfully accompanied by the hardier soldiers from the Rwandan battalion, who do most of the heavy lifting. UN police officers are also present to lend a hand. 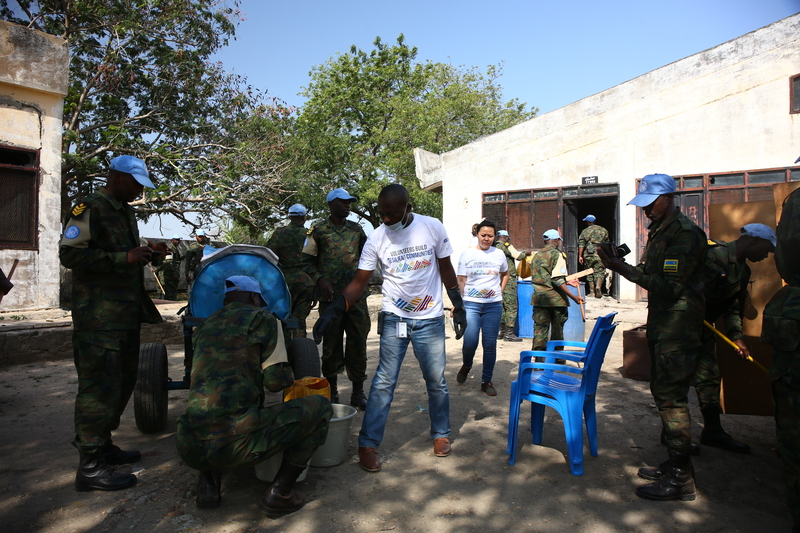 “We as volunteers wanted to share our love, camaraderie and expertise for this noble effort to create a safer place and contribute to building a resilient community in Malakal town for people to return to,” says Begimai Ashiralieva, the UN Volunteers Coordinator. The SOS Children Village was built in 2011 for more than 100 children. In 2013, the orphanage was attacked and looted, and children had to be evacuated and relocated by the United Nations to other facilities in Juba. Canada-based Padang Relief Society is working towards restoring the orphanage and making it the haven it once was for vulnerable children. The first thirty children are expected to arrive by the end of the year. The Malakal UN Volunteers team will continue to support the orphanage by organizing clean-up and reconstruction works as well as mentorship programmes for the orphans in the future.